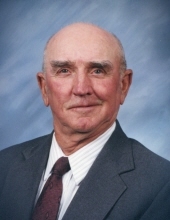 Don Leroy Kenney, of Holden, Missouri passed away on January 31, 2019 at the age of 91 at the Missouri Veterans Home, Warrensburg, Missouri. He was born May 30, 1927 on the farm near Austin, Missouri. He was the son of David Hurley and Daisy (Knowles) Kenney and brother to Shirley (Kenney) Longstaff. Don attended and rode his pony to Mullen Country School near Archie, Missouri. He attended Archie High School for 2 years and graduated from Garden City High School in 1945 after his family moved to the farm near Garden City in 1943. Don became a Christian and joined the Austin Baptist Church. After their move, he became a member of the Garden City Baptist Church. He worked on the farm until he was drafted into the Army. He was stationed in Kansas, Texas and Oahu, Hawaii. While serving in Hawaii, he received the WWII Victory Medal, M1RifleSS176 with a rank of Tec. 4. When he returned home, he resumed farming with his father. On June 20, 1948, Don and Helen Marie Lotspeich were united in marriage at the Garden City Baptist Church, thus they have been married over 70 years. After their marriage, they lived on the farm with Don’s parents until the farm sold. Then with their 3 sons, they moved to the farm near Holden, Missouri in 1967. Don liked all kinds of sports and enjoyed watching their 3 sons play in various sports as well as other activities. He enjoyed hunting and fishing which he started doing as a young boy with his dad. Don taught his own sons the same sports and how to hunt and fish. They had some wonderful hunts and times together hunting quail, turkey, deer and dove. Don and his sons also enjoyed trips together to South Dakota to hunt pheasants. Don and his good friend “Hap” Hays opened the quail season together for over 60 years. He was happy to live and work on the farm and see the results of his labor. Although none of his sons chose farming as their occupation, they like to spend time there with their families and are thankful for the legacy he instilled in their hearts. Don was a friendly person and enjoyed talking with people. He was known for his teasing, humor, joking and wit. Don was preceded in death by his parents; a daughter, Dona Diane in 1950; 2 sons, Michael Don in 1955 and a still born son in 1962; his sister, Shirley Kenney Longstaff in 1968. Don is survived by his wife, Helen; 3 sons, Douglas R. Kenney and wife Kristi, Clinton, Missouri, Mark V. Kenney and wife Mary, Overland Park, Kansas, Russell W. Kenney and wife Judy, Warrensburg, Missouri; a niece, Cindy Longstaff Julian and husband Mike and son Nicholas, Roeland Park, Kansas; a nephew, Greg Longstaff. Their home was shared through the years with a nephew, Calvin Leslie. He is also survived by 11 grandchildren, Jeff Kenney and wife Lara, Josh Kenney and wife Paige, Jake Kenney and wife Melana, Jaime Briggs and husband Colt, Sam Kenney and wife Emily, Max Kenney and wife Nicole, Luke Kenney, Michele Hunolt and husband Doug, Mike Kenney and wife Tarah, Brad Kenney and wife Shelby and Andrew Kenney and companion, Carly Thomas; 19 great-grandchildren; other relatives and many friends. Funeral services were held Monday, February 4, 2019 at the Dickey Funeral Home, Garden City, Missouri with burial in the Garden City Cemetery. Family received friends Sunday, February 3, 2019 at the funeral home. Family suggests memorial contributions may be made to the Garden City Cemetery Association or the Missouri Veterans Home, Warrensburg, Missouri. To plant a tree in memory of Don L. Kenney, please visit our Tribute Store. "Email Address" would like to share the life celebration of Don L. Kenney. Click on the "link" to go to share a favorite memory or leave a condolence message for the family.